Win Sentry boosts Windows Server performance. 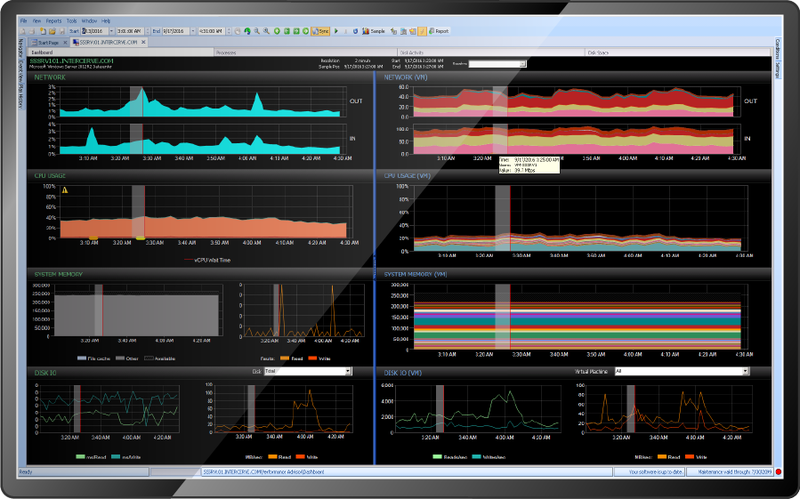 Win Sentry makes Microsoft Windows Server performance monitoring easier. With Win Sentry, you can correlate and track Windows performance metrics and processes, grouping by applications such as SharePoint, Internet Information Services (IIS), SQL Server Reporting Services (SSRS), and SQL Server Integration Services (SSIS). This solution provides OS insight around disk latencies, disk space, and core resource utilization. The Hyper-V host dashboard allows you to see how resources are being allocated and utilized by virtual machines and allows you to easily jump to a VM dashboard. Win Sentry also provides critical Windows performance metrics as part of SentryOne, and within the SentryOne platform empowers DBAs to troubleshoot with confidence by giving full visibility into their entire environment. The dashboard provides a per-VM breakdown of resource utilization, helping you find the “noisy neighbor” that could be causing performance issues. See Hyper-V Host Metrics section in the link below. Allows you to identify which OS processes are consuming resources at any time, and automatically groups common processes into their application groups, such as SQL Server, IIS, and server host. Get easily configurable, highly customizable cloud access to your performance data. Our unique Server Health Status view lets you see the health of your entire environment on a single screen. View application performance over multiple servers from a common baseline, to easily identify when systems deviate from normal behavior. Use an Outlook-style calendar to view Windows Event Log and manage schedules for Windows Task Scheduler. Use the configurable history filter in event sources to control which events are collected, displayed on the calendar, and available for alerting. Quickly and easily define dependencies and workflows involving Windows tasks with Win Sentry's advanced job chaining features. Take advantage of pre-formatted reports available on any metrics Win Sentry collects, from a global level down to individual counters. Along with the SentryOne Performance Analysis Dashboard, you can quickly gain an understanding of Windows Performance in your monitored environment. Discover potential problems before users do, using a multitude of built-in alerting conditions covering everything from server outages to long-running jobs and queries. SentryOne provides pre-defined Advisory Conditions (Advisory Conditions Pack) to get you started, but the Advisory Conditions interface allows you to build new conditions for virtually anything you can imagine, from a single query to test the status of your in-house application to complex tests involving conditional logic and multiple Advisory Conditions. You can get customizable cloud access to your performance data. Server Health Status allows you to view the health of your entire environment. View application performance over multiple servers from a common baseline to identify when systems deviate from normal behavior. Are you able to quickly determine whether a performance bottleneck is in your application versus in your database? Win Sentry gives you that visibility, both for application servers and for Hyper-V hosts. Are you running SQL Server on Hyper-V? Win Sentry is the performance solution you need now. The tight, seamless integration between V Sentry and SQL Sentry lets you easily drill through metrics to quickly uncover the root cause of performance problems. Ready to make Windows Server performance monitoring easier? Our motivated customer success team is ready to help you break through your data platform barriers. How many Windows Server instances to quote?